You’ve probably heard the term “Employee Voice” brought up in several conversations lately. The employee engagement landscape is shifting, and strategic HR pros are looking for more agile tools that allow them to truly tap into the value of their most important asset: their people. And that’s a worthwhile goal. On average, American workers will spend 90,000 hours of their lives at work. Don’t they deserve the right to know that their time is being dedicated to an organization where their work and insights contribute to a shared purpose? Perhaps one they even enjoy working for? Employee Voice can be defined as an opportunity for employees to have a true stake in organizational performance accompanied by a belief that they can express their views and leaders will listen. It’s a chance to incorporate every voice when making decisions that will influence business outcomes. Embracing the concept alone of Employee Voice is not enough to make meaningful change at an organizational level. Leaders that see the biggest return with EVP programs go further: decentralizing information and shifting from top-down leadership dictation to team-led accountability, regularly asking questions that matter, and then creating collaborative action plans that transform feedback into positive change. Leaders have a wide array of needs that go beyond measuring engagement. 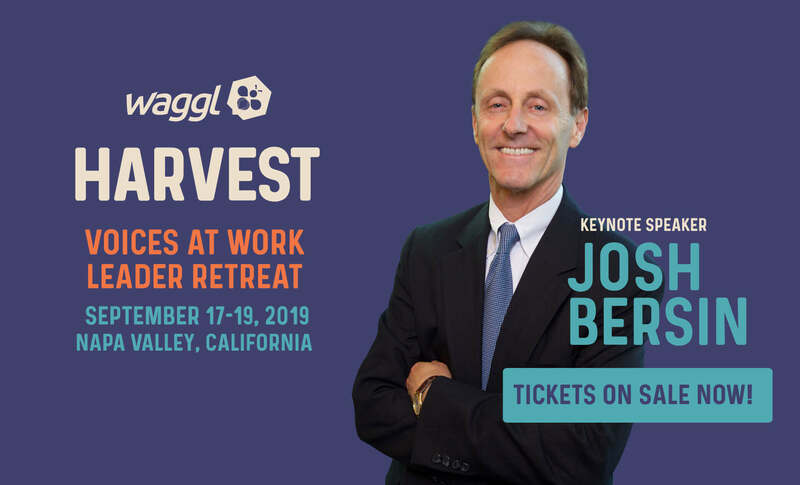 They need to plan how to truly improve employee engagement, how to build healthier cultures, how to succeed with important internal transformation initiatives, and how to achieve operational excellence. With a variety of initiatives, it can feel daunting to consider replacing or augmenting your engagement program with Employee Voice, even if your older program hasn’t been driving results. So then, how do you get started? Leaders that choose to embrace Employee Voice need to learn how to have a conversation with their team at scale, and how to create a replicable process that prioritizes feedback into an action plan. This is a muscle that takes time to build and consistency is important. EVPs that incorporate real-time crowdsourcing help take some of the pain out of prioritizing the first initiatives to kick off. Employees on the front-line are keenly aware of the issues that need to be addressed most urgently…just ask them! Let’s talk about a real example. Employee Voice advocate and leader Matthew Gosney, Ed.D, is the Vice President of Organizational Development and Learning Services at UCHealth. In 2017, UCHealth took a bold move forward, replacing their annual engagement survey with Waggl, an Employee Voice platform, and committing to a new model of continuous conversation. The innovative approach UCHealth undertook has helped shape engagement strategies at countless organizations. Why has it been so successful? It’s simple when you have the right platform; one that combines people intelligence and technology. Matt breaks it down into four steps. A fifty question survey allows for depth and data, but how many of the questions actually address things your people care about? Lean into the conversations you know are happening around the water cooler and ask an important question to start. What kind of question would this be at your organization? At UCHealth, leaders engaged their teams in results summits the day after the first pulse closed to discuss the results. Leaders and teams reviewed crowdsourced prioritized responses and engaged in conversation about the results identifying strengths, opportunities, and actions, deciding what to start, continue and stop doing as a result. With a platform that allows for crowdsourced ranking of ideas, prioritization of the topics to begin to work on is easy. Employees respond anonymously which allows the best ideas to be shared without employee worry of backlash, and leaders see transparent results which puts the appropriate pressure on leaders to take action on things that truly matter. A big part of the Employee Voice program is enabling leaders and teams to hold themselves accountable without HR needing to constantly follow up. A 2 question check-in pulse 2-4 weeks after the initial conversation gives visibility to what conversations are happening and on track, and which are not. With results that are easy to understand and act upon, check in pulses simply continue the conversation cycle to guarantee success. 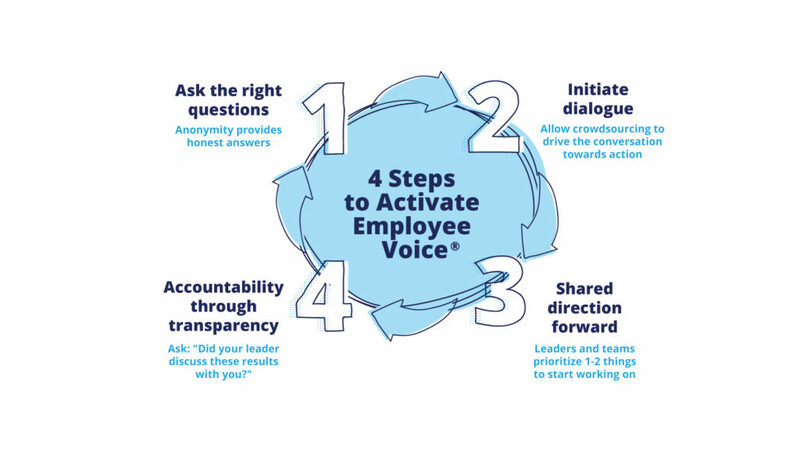 When we consider these four steps as a model, it’s easy to draw a distinction between the activation of an Employee Voice approach and a more typical engagement process. Annual engagement surveys and many more frequent pulse surveys that don’t actively promote transparency and crowdsourcing in real-time do not go far enough, fast enough. “We didn’t want to wait 3-4 months down the road before we got our results back. That’s a horribly inefficient process. It’s like your navigation system telling you that you should have turned 5 miles ago. It doesn’t allow us to make an appropriate change at a tactical level,” Matthew Gosney reflected. With constantly shifting business landscapes and change coming to every industry at an unprecedented rate, Employee Voice offers the agility organizations need to stay ahead of the curve. Learn more about the #1 solution for Employee Voice by requesting a demo today.